The righteous shall flourish like the palm tree. The Biblical cedars of Lebanon have towered on mountaintops for thousands of years. Lebanon, a country mentioned in the Bible more than 70 times, today carries the cedar on its flag. The towering cedar is prized for both its quality and the stability of its wood, not to mention its fragrance. Our Lord Himself walked the rugged country of Lebanon when He visited Tyre and Sidon. He foresaw all that would come to pass. He also looked to our days, and saw all the crises facing not just Lebanon, but the entire world. It was here that Divine Providence raised up a man who could be called a true “cedar of Lebanon.” An exemplar of every virtue, his mission would be to help not just the people of his homeland, but the entire world. The quality of his life, the stability of his total dedication, and the fragrance of his sanctity rose to the heights of heaven. God gave to this man great power to work miracles. This man was Saint Charbel Makhlouf. 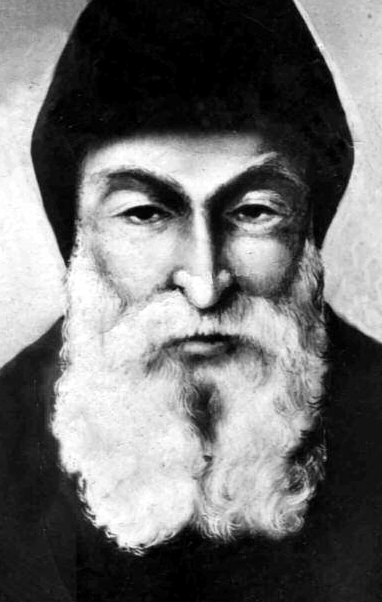 Charbel Makhlouf was born on May 8, 1828. He was the fifth child of Antoun Zaarour Makhlouf and Brigitta Chidiac. At baptism he received the name of Youssef (Joseph). The family lived in the rural village of Bekaa-Kafra, high in the Lebanese mountains. At his mother’s knee young Youssef learned to pray with great devotion. As was the custom among Maronite Catholics, the children knelt and repeated their mother’s prayers before the small home altar at day’s end. The smoke of incense rose with their prayers at evening twilight. In the heat of summer or the snows of winter, the thoughts of Youssef always turned heavenward. With each passing day, he fervently prayed to Our Lady that he could live his days entirely in God’s service. Exterior of Saint Charbel Makhlouf’s house in Bekaa Kafra, Lebanon. At 23, Youssef quietly left home and headed for the Monastery of Our Lady in Mayfouq, Lebanon. 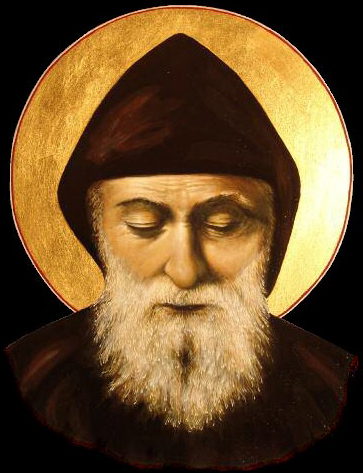 Here he began the novitiate, taking the monk’s habit and the religious name “Charbel,” after a second century martyr. After the first year of novitiate, Brother Charbel was sent to the monastery of Saint Maron at Annaya. Here he learned to sing the Divine Office seven times a day. The Maronite monks held all of their ceremonies in Aramaic, the language spoken by Our Lord. He studied the Divine Liturgy and the monastic duties, always striving to make progress in the way of perfection. Apart from this, Charbel took on the domestic works of the monastery, including baking bread, cultivating the land, making shoes, mending and washing clothes and working as a carpenter. 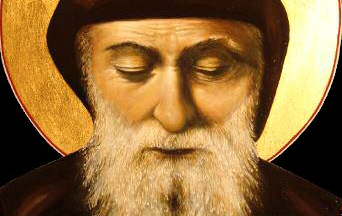 In 1853, at the age of 25, Charbel pronounced his solemn final vows of poverty, chastity and obedience. He was next sent to another monastery to study theology. Here Charbel proved himself as an excellent student and an exemplar of sanctity. After six years of study he was ordained a priest on July 23, 1859. Father Charbel returned to the monastery of Saint Maron at Annaya. Here he would spend the rest of his life. The new priest was reverent in the exercise of his sacred duties. With great humility he also performed the manual labors of the community. The piety of Father Charbel could not be confined to the monastery, and word soon spread of his deep devotion and self-mastery. One day the monks were working in the fields when they found a dangerous snake. Every attempt to frighten off the serpent failed. Father Charbel was called. He calmly rose from his prayers, approached the snake, and commanded it to go away and never return. The snake immediately obeyed and slithered away. On another occasion, swarms of locusts began to plague the area, endangering the crops. Father Charbel once again calmly approached the pests and commanded their departure. The locusts left immediately, and the harvest was spared. From an early age Father Charbel felt the call to greater solitude. He sought permission many times from his superior to move to a nearby hermitage. But Father Charbel was very useful to the community. His superior did not want to give permission, and so continued to delay Charbel’s request. After serving for 16 years as a priest in the monastery, divine intervention would obtain the desired permission for him. Again Father Charbel asked his superior for permission to become a hermit. His superior again deferred, asking Father Charbel to study a matter of some urgency. His superior gave him permission to stay up past the usual hour to finish the task. Word of this miracle reached the Superior General of the Maronite Order. He authorized Father Charbel to take up residence at the hermitage of Saints Peter and Paul close to the monastery. From 1875 to his death, Father Charbel lived the secluded life of a hermit. He always held himself to the strictest discipline and would undergo strict penances and fasting. At over 5,000 feet above sea level, the hermitage provided little shelter from the harsh winter or the heat of summer. Father Charbel kept a hair shirt hidden beneath his habit. With little food and deprived of every comfort, Father Charbel was the happiest man on earth. Our Lord Jesus Christ became his strength and his joy, his only reason for being. 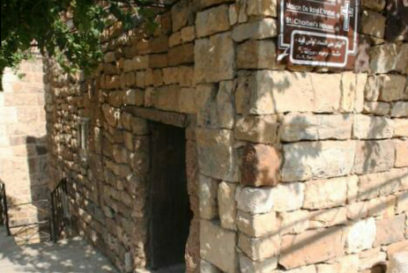 Father Charbel daily offered Holy Mass in the seclusion of his hermitage. He would spend hours on his knees preparing for Mass, and hours afterward in thanksgiving. For 23 years, his offering the Divine Liturgy in the sacred mountain hermitage called down the blessings of heaven on him, his country, the Church and the world. Those who assisted always said the same about him: his voice was low, but his face shone with an interior joy. His deep union with His Divine Master radiated in every word and action. Father Charbel’s obedience became legendary, his angelic chastity encompassing his whole being, and his poverty going to extremes not reached by many other saints. In December of 1898 while offering Holy Mass, Father Charbel suffered a stroke. The servant assisting him had to pry the Sacred Host from his hands. Just seven days later, on Christmas Eve, he passed into eternity. Following the funeral rites, Charbel’s fellow monks carried his body to his tomb. As was the custom, his body was placed in a tomb in the monastery cemetery with no embalming and no coffin. For the last time Father Charbel was clothed in his monastic habit. The heavy snows of winter made the burial difficult for his brother monks. The holy hermit thus lay forgotten by the world. But God’s eyes were ever on His servant. A short time after his burial, his fellow monks and nearby villagers noticed an extraordinary light coming from his tomb. The light shone for 45 days, and word quickly spread near and far. The monks soon sought ecclesiastical permission to exhume the body. This was done in the spring of 1899, four months after Charbel’s death. Frequent rains had flooded the cemetery several times, but the body was found completely incorrupt. The newly-opened tomb revealed the peaceful remains of Father Charbel floating on mud in a flooded grave. The monks of Annaya carefully cleansed and reclothed the body, which remained flexible with no signs of decay. Father Charbel’s remains were transferred to a wooden coffin, this time in a corner of a private chapel in the monastery. Another unusual occurrence came with exhuming Father Charbel’s body. A liquid described as a mixture of sweat and blood issued from the body’s pores. As a result, the bloodstained clothing on the relics of this holy hermit needed to be changed twice a week. Pieces of cloth soaked in this liquid were given to those who approached Father Charbel with their petitions. News spread of numerous cures and healings. 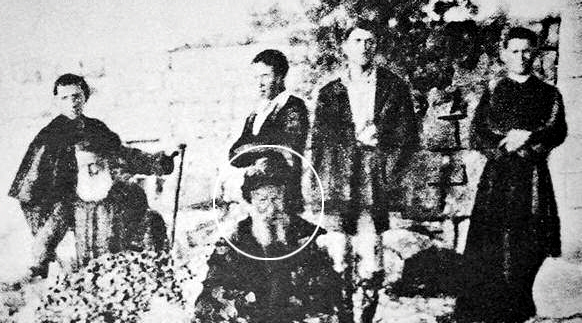 On July 24, 1927, two doctors with the French Medical Institute examined Father Charbel’s body in detail. They drew up various documents which were submitted to the proper Church authority. Their testimony was signed in the presence of ecclesiastical judges and other witnesses. The body of Father Charbel was clothed in new priestly vestments and placed in a new coffin of wood covered with zinc. A zinc tube containing all the documents pertaining to his case was sealed with the remains in a new tomb. The monks built an oratory especially for prayer before Father Charbel’s remains. His body lay undisturbed here for 23 years. 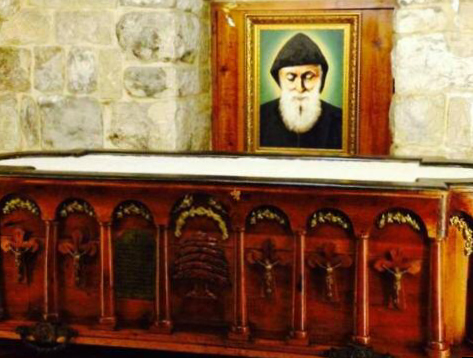 The carved casket containing the sacred remains of Saint Charbel. The Lebanese saint has worked great miracles for those who have made pilgrimages to venerate his holy relics. In 1950, Pope Pius XII declared a jubilee year. Pilgrims to Father Charbel’s tomb noticed a liquid seeping from the tomb and flowing onto the floor. The superior ordered the tomb opened at once, fearing damage to the precious remains. The tomb was dry, except for the liquid that flowed from a crack in the casket. Permission was granted to open the casket. In the presence of Church authorities and physicians the seal on the casket was broken on April 22, 1950. The liquid composed of sweat and blood continued to flow from Father Charbel’s body, which remained flexible and lifelike. While the body was being examined, no less than 5,000 pilgrims each day were arriving at the monastery. On feasts and Sundays, the numbers exceeded 15,000. Many traveled from distant countries in anticipation of a cure or favor. In just two years after exhuming the body of Father Charbel, the monastery had collected 1,200 reports of miracles. A third time Father Charbel’s remains were exhumed in 1965, and once again they were found intact and secreting the same liquid. On December 5, 1965, Pope Paul VI presided at the beatification of Father Charbel in Saint Peter’s Square. For reasons known only to God, when Father Charbel’s remains were exhumed in 1976 it was found that the body had succumbed to the effects of nature. Only the skeleton remained. This did not, however, stop the flow of miracles even for an instant. Since his death over a century ago, Saint Charbel has taken his place among the greatest miracle workers of the Church. Nearly every Catholic in Lebanon knows personally someone who has benefited from the healing power of this great saint. of Saint Charbel upon exhumation in 1899, 1927 and 1950. In 1993, a 55-year-old woman from Lebanon named Nouad El Shami suffered paralysis on the left side of her body. After examinations, the doctors said there was no treatment for her condition. Returning home, Nouad later recounted a dream she had on the night of January 22, 1993. In the dream, two Maronite monks stood over her bed. One laid hands on her neck and operated on her, while the other assisted holding her pillow. When she awoke, she discovered two wounds on her neck. She was completely cured and could walk again without trouble. The next night, Saint Charbel appeared to her in her dream stating: “I did the surgery to let people see and return to faith. I ask you to visit the hermitage where I lived on the 22nd of each month, and to attend Mass regularly for the rest of your life.” Since that day, the faithful fulfill this request and gather each month to pray at the hermitage. Early in 2012, a 17-year-old boy from Venezuela named Hanna Jabbour went to the hospital to have the doctors examine large red welts on his legs. After running tests and consulting a specialist, Hanna was diagnosed with blood cancer. Young Hanna was given just six months to live. His condition prompted an extended stay in intensive care. Hanna was in the hospital for 20 days when his uncle came to visit him. His uncle had returned from Saint Charbel’s monastery and brought a photograph of the saint for his nephew. Hanna thanked his uncle and placed the photo of Saint Charbel under his pillow. When his visitors left that evening Hanna prayed the rosary and asked Saint Charbel for healing. That same week Hanna’s father was staying with him in the hospital room. He was awakened when Hanna complained of feeling something cold on his back. Hanna’s father lifted him up and found the photo of Saint Charbel on his back, covered in fresh blood. Pulling the photo off, he was stunned to find that his son was not bleeding, having no cuts or bruises. Immediately Hanna’s father called for the priest. Within the hour the priest arrived, and on seeing the astounding event told them not to reveal the photo to anyone, but simply have the doctors examine Hanna. In the morning, the doctors ran new tests, and were astonished to find no trace of the cancer. On leaving the hospital in perfect health, Hanna Jabbour showed the blood-stained photo to everyone and recounted how Saint Charbel had healed him. Even greater than this healing was the fact that Hanna’s family members, away from the sacraments, began to lead devout lives once again and spread devotion to Saint Charbel. On January 16, 2016, the relics of Saint Charbel were brought to Saint Joseph’s Maronite Catholic Church in Phoenix, Arizona. Dafne Gutierrez was invited by her sister to venerate the relics of Saint Charbel. Dafne suffered from benign intracranial hypertension. In 2012 she lost vision in her right eye, and by 2015 was completely blind. The doctors were at a loss for treatment, recommending she enter a nursing home due to occasional seizures. Dafne, her husband and three children came to Saint Joseph’s and went to confession. They prayed before the relics, and a priest anointed Dafne’s eyes with sacred oil. The following day, Dafne and her family returned for Sunday Mass, and they again venerated the relics and Dafne was anointed by the priest. News of this miracle spread quickly, and Saint Joseph’s Church was flooded with people seeking to venerate Saint Charbel’s relics. Another miraculous cure happened that same week when a Phoenix woman was cured of cancer. Father Akiki, pastor of Saint Joseph’s, erected a large outdoor shrine to Saint Charbel, where monthly devotions are thriving. True to form, Saint Charbel’s miracles have brought a great increase of faith. Archivists at the monastery of Annaya, Lebanon continue to document miracles performed by Saint Charbel. Since the 1950s, the number of authenticated cures of people around the world has reached over 26,000! But as impressive as so many miraculous cures are, Saint Charbel does something far greater. The numbers of those cured is a fraction of those who climb the sacred mountain or pray around the world, asking for his help. And he does give help. Saint Charbel imparts his own strength for his devotees to carry their crosses. The grace to endure one’s sufferings until death is a miracle of the soul—far greater than any bodily healing. Over and over again, Saint Charbel works wonders when the circumstances seem impossible. In the many dire circumstances we face today, no worldly solution can be found. For our own needs and those of so many others, let us invoke the powerful help of Saint Charbel with confidence. From the time Saint Charbel entered the monastery, no one except his fellow monks saw his face, nor did anyone take his photo. On May 8, 1950, four Maronite Catholic priests from Scranton, Penn., were on a pilgrimage to Saint Maroun’s Monastery in Annaya, Mount Lebanon, to visit Saint Charbel’s tomb. One of their number, Father George Webby, took a photo of the four Maronite Catholic priests and the guard on duty outside the monastery. When Father Webby developed the photo, he noticed an additional person with a white beard standing in the middle of the photo with the other priests. He immediately went to the monastery to ask the monks if they recognized the “mystery” person in the photo. All the older monks, who had known Father Charbel in his later years, convincingly attested that it was indeed Saint Charbel. Experts ruled out trick photography. Coincidentally, the date the photo was taken, May 8th, was Saint Charbel’s birthday. All subsequent photos and portraits of Saint Charbel have been based on the photo taken by Father George Webby, including the photos and portraits displayed at Saint Peter’s Basilica in Rome during his beatification and canonization. *For a miraculous cure by Saint Charbel, please click here. Published in Crusade Magazine, Vol.154, July-August, 2018, pp. 12-16. This entry was posted in Catholic Perspective and tagged America, apparition, Arizona, cancer, Catholic, Charbel Makhlouf, Church, confidence, Cross, cure, Devotion to Mary, faith, Family, grace, healing, help, hermit, Lebanon, Maronite, miracle, miraculous, monk, our times, Phoenix, pray, prayer, priest, rosary, sacrifice, Saint, Saint Charbel, self-control, soul, suffering, Venezuela, wonder worker, world by Ben Broussard. Bookmark the permalink.